2) To help “jump-start” a locally sustainable citizen-based monitoring program in the region through outreach, training, and more spontaneous forms of interaction between team members and the host community. IPP Jump-Start was piloted on one of the most highly-valued and more vulnerable lakes in Maine (also the state’s largest lake): Moosehead. If such a project could succeed on this grand scale, it was likely that it could succeed anywhere in the state. 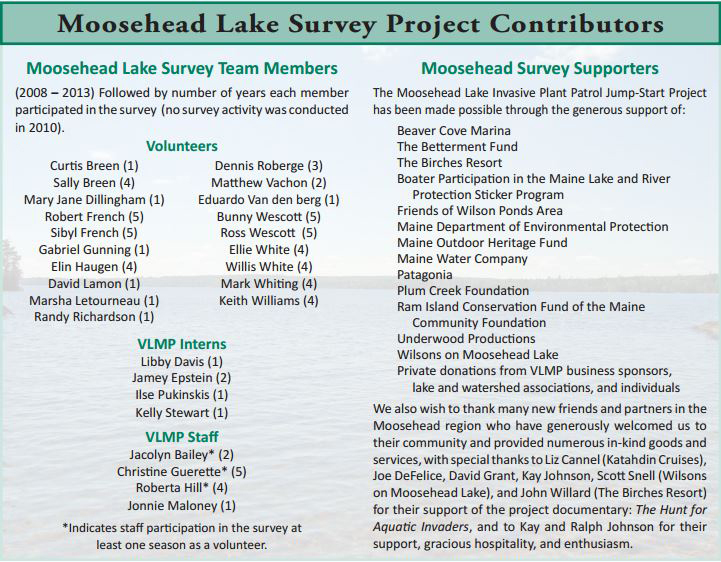 This first-ever, volunteer-powered aquatic plant survey of Maine’s largest lake, Moosehead, was completed in 2013. The entire shoreline of the 74,000-acre-plus lake was methodically screened for aquatic invaders. NO invasive species were detected. A high percentage of the volunteers who participated in this project over its six year timespan remained active throughout, which helped to create a cohesive, highly-competent team. The logistics of surveying a lake the size of Moosehead are challenging to say the least—challenges ranging from where the team will make base camp and how will meals be organized, to the more critical issues of access, on-lake communication, and safety. Each challenge was deftly handled by the team, with volunteers team members taking on key roles in all phases of the project . . . planning, facilitation, technical support, training, outreach, survey activity, plant identification, documentation, reporting, follow-up, etc. · The shoreline of Moosehead Lake, including the islands, measures 281 miles. If one takes into account deployment of boats over significant distances (often with larger motorized boats, towing smaller paddle craft) and the methodical travel back and forth along transects that is required to survey fertile coves and extensive shallows, the actually scope of the survey was substantially greater. The survey was done in short annual increments and took six years to complete. Actual time on the water however was remarkably short: 23 days! · During the course of the survey, the team also documented all of the native plants found growing in the lake. A whopping 110 plant species have been documented. Thirty plant specimens of note have been submitted to the Maine State herbarium. · A project on this scale, were it to have been done by professionals, would have been extremely costly, with a price tag in the tens of thousands–a cost prohibitive to most state agencies, municipalities and non-profit lake conservation groups. Volunteer engagement not only enabled this project to happen, it showed that high-quality survey could be done, efficiently and effectively, by volunteers. Studies conducted throughout the country have consistently shown that information collected trained citizen scientists is equivalent to, and indistinguishable from that of professional scientists, at a fraction of the cost. This groundbreaking project on Maine’s largest lake serves as a powerful case in point! 1 The LSM (then known as VLMP) survey team did not monitor the lake for invasive fish. Two non-native fish species are known to be established in Moosehead Lake: small mouth bass (Micropterus dolomieu), and white perch (Morone americana). Both were the result of illegal introductions. 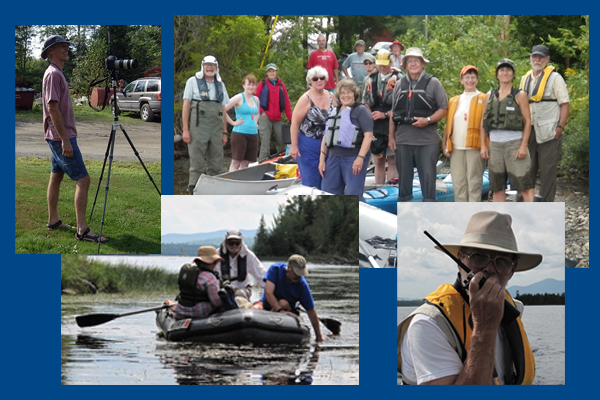 Click here for the list of Moosehead Lake Survey Project Contributors. The Hunt For Aquatic Invaders – The Moosehead Jump-Start story was captured by videographer Steve Underwood in extraordinary high-definition footage. DVDs of the Hunt are available for $10 plus shipping and handling. Contact the LSM to order yours today! 207-783-7733 or christine@lakestewardsme.org. Please click here for the most recent update on the Moosehead Lake IPP Survey.